Objective To present family physicians with common nail alterations and disorders occurring in the elderly population and their management options. Quality of evidence The evidence relating to different nail conditions is mostly derived from randomized controlled trials, meta-analyses, and review articles. However, given the scarcity of evidence on some conditions, articles with weaker levels of evidence were also included in our review. Main message Given the growing elderly population and the associated demographic changes and longer lifespans, geriatric care is becoming more of a complicated and multidisciplinary effort in which the role of the family physician is increasingly important. Although common among the elderly, nail changes are often not brought to the attention of primary caregivers and are thus overlooked. These nail changes can affect various components of the nail unit and might represent normal age-related nail alterations or nail abnormalities that require immediate intervention. Knowledge and familiarity with these common nail abnormalities and their underlying causes is important for the family practitioner in order to effectively reach an accurate diagnosis and provide better care of this large and growing elderly population. Conclusion Nail changes are common in the elderly, and family physicians are best placed to diagnose and treat these common problems. It is important that family physicians also recognize less common but more serious nail problems that require immediate treatment. Older people are at an increased risk of nail alterations, including normal age-related changes and disorders that more commonly affect this specific population. 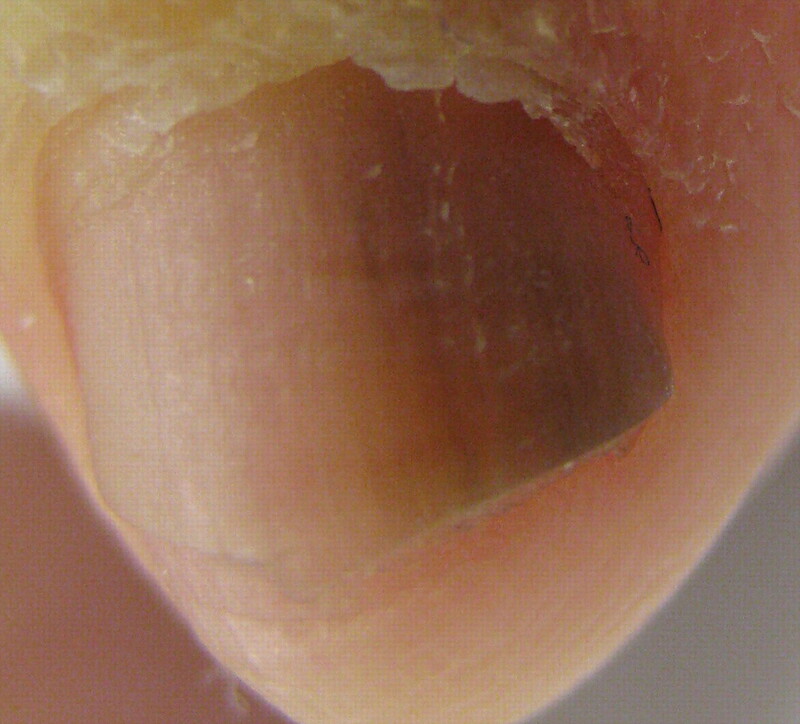 Secondary factors are important contributors to pathologic nail changes, including impaired circulation at the distal extremities, faulty biomechanics, infections, neoplasms, and skin or systemic diseases with nail manifestations.1,2 These factors can affect primarily the nail plate or involve other components of the nail unit such as the matrix, nail bed, hyponychium, or nail folds (Figure 1), with secondary abnormalities in the nail plate. These nail changes can either cause serious symptoms, impairing the daily activities of this older population whose activities might already be restricted, or be asymptomatic but associated with substantial cosmetic problems, leading to negative psychological effects. A primary care physician who is knowledgable about and familiar with these age-related nail alterations and disorders will be able to recognize and manage common pathologic changes, as well as refer patients for more specialized care, if needed. Using a literature search and cross-referencing, we identified articles published before September 2009 that were relevant to the topic. In September 2009, we performed a MEDLINE search using MeSH terms nails diseases and aged with key words relevant to each specific age-related nail change and disorder. We identified 2496 articles, 32 of which were selected. We mainly chose randomized controlled trials, meta-analyses, and review articles, when available, on each specific nail entity, especially those concerned with elderly patients. When such strong evidence was not available, which was the case for some conditions such as scabies involving the nail unit, case reports or series were chosen. We selected only those articles written in English. Using the 3-point grading classification system of evidence-based medicine and given the paucity of evidence on some of the conditions, articles with different levels of evidence (I, II, or III) were included in our review. 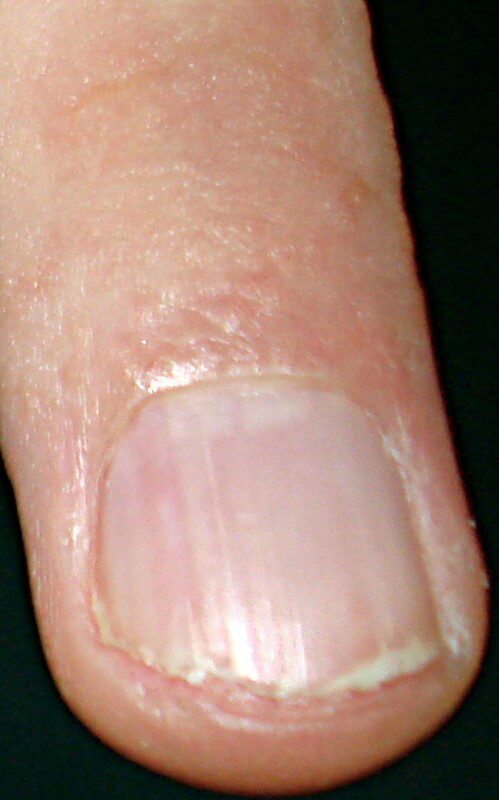 With advancing age, normal characteristic changes in the growth rate and morphology of the nail plate occur.1,2 The underlying mechanisms for these changes are still not completely understood but might be related to dysfunctional blood circulation at the distal extremities or to the effects of ultraviolet radiation. Brittle nail disorder is considered a polymorphic abnormality characterized by increased fragility of the nail plate (Figure 2). It affects around 20% of the population, with increased incidence in women and in older people.5 It manifests clinically with varying severity of onychoschizia or onychorrhexis.5 Onychoschizia is usually caused by impairment of intercellular adhesion between the corneocytes that make up the nail plate. This results in transverse splitting due to breakage of the lateral edges of the nail plate and in lamellar splitting of the free edge and distal portion of the nail plate. Exogenous factors (eg, repetitive cycles of wetting and drying, trauma, and fungal proteolytic products) and chemicals or cosmetics (eg, cuticle removers, nail enamel solvents, and nail hardeners) are among the underlying causes. Onychorrhexis, on the other hand, frequently manifests as nail plate splitting or ridging, longitudinal thickening, or multiple splits leading to triangular fragments at the free edge. It is usually the result of nail matrix involvement leading to abnormalities in epithelial growth and keratinization. Among the various factors causing onychorrhexis are abnormalities of vascularization and oxygenation (such as anemia or arteriosclerosis), as well as systemic (metabolic, endocrine, etc) and dermatologic diseases (disorders of cornification and inflammatory diseases). 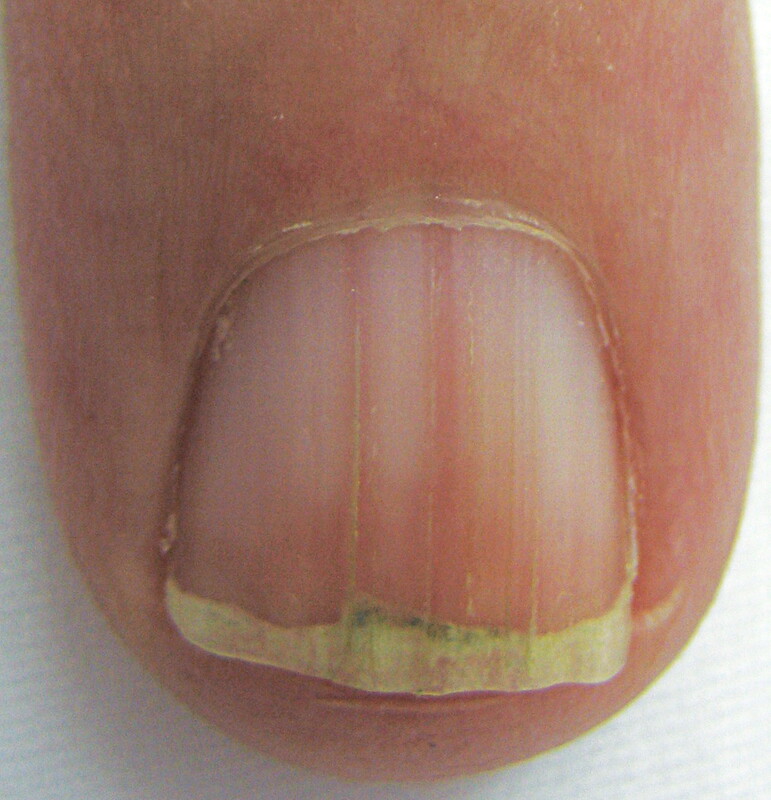 Localized hypertrophy of the nail plate (Figure 3), also known as onychauxis, commonly manifests clinically as loss of nail plate translucency, discoloration, and often subungual hyperkeratosis. It might be associated with pain, and with time can become complicated by distal onycholysis, subungual hemorrhage, subungual ulceration, or increased risk of onychomycosis.1,2 Advancing age or faulty biomechanics, which are usually more common in the elderly population (eg, overlapping and underlapping toes; foot-to-shoe incompatibility; or digiti flexi characterized by contracted toes secondary to buckling of toes induced by shortening of the controlling muscles), might be contributing factors. Onychauxis: Localized hypertrophy of the nail plate with discoloration and loss of nail plate translucency. 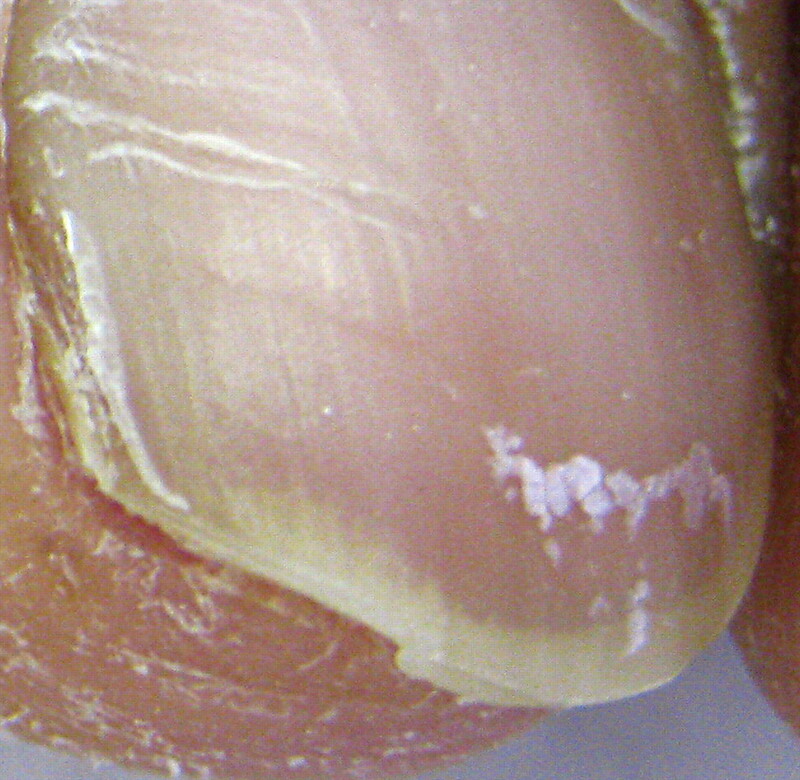 Periodic debridement of the thickened nail plate, either partially or totally, is the preferred initial therapy (level III evidence).1,2,9 Other treatment options that might be of benefit include electric drills, nail avulsion, or 40% or higher urea pastes (level III evidence).1,2,9 Chemical or surgical matricectomy might be used as a last resort in complicated cases or those with recurrences in order to achieve permanent ablation of the involved nail plate. Clinically different subtypes of onychomycosis are recognized, among which distal and lateral subungual onychomycosis is the most common (Figure 4).10,11 This subtype of onychomycosis, usually caused by T rubrum, presents with onycholysis, subungual hyperkeratosis, nail thickening, and discoloration, and is caused by fungal invasion that starts initially at the hyponychium, with progressive proximal spread along the nail bed. 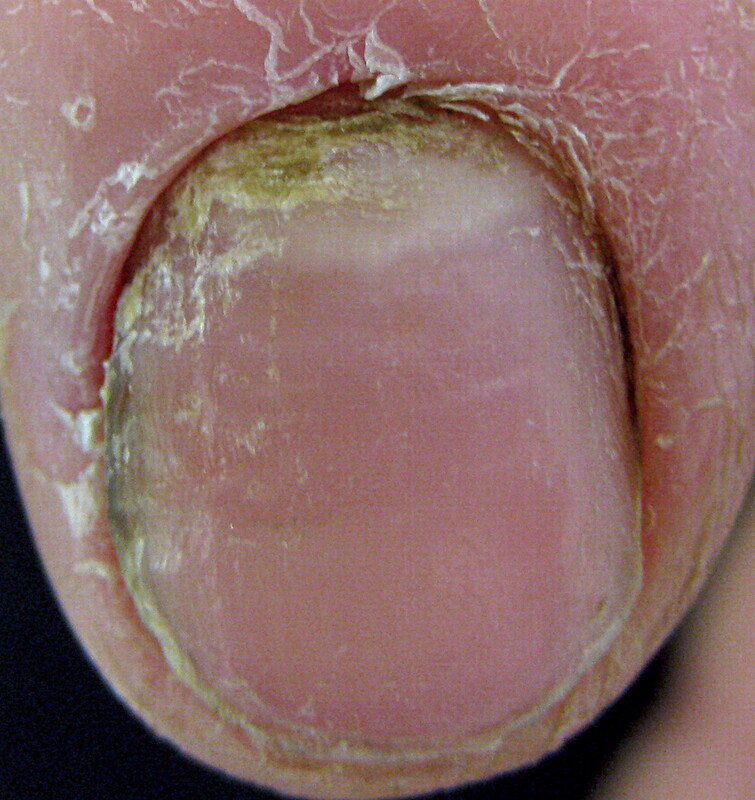 Another subtype is superficial onychomycosis (Figure 5), which presents as black (caused by dematiaceous fungi) or white (caused by T mentagrophytes) patchy discoloration of the nail plate secondary to fungal invasion of the dorsal surface of the nail plate.10 Proximal subungual onychomycosis, usually caused by T rubrum, clinically manifests as a white area under the lunula that progresses distally; it is an important subtype to recognize, as it commonly affects immunocompromised individuals and can be a clue to HIV infection.10–12 It results from fungal invasion of the proximal nail fold with secondary extension to the nail plate. Total dystrophic onychomycosis is also a subtype of onychomycosis and might be observed in immunodeficient patients, including patients with HIV and those with chronic mucocutaneous candidiasis.10,13 It is an advanced form characterized by progressive destruction of the nail plate, leading to the exposure of an abnormally thickened nail bed, and it might be fairly acute or progressive, simply representing an end stage of other forms of onychomycosis. Distal and lateral subungual onychomycosis: Onycholysis, subungual hyperkeratosis, as well as nail thickening and discoloration. 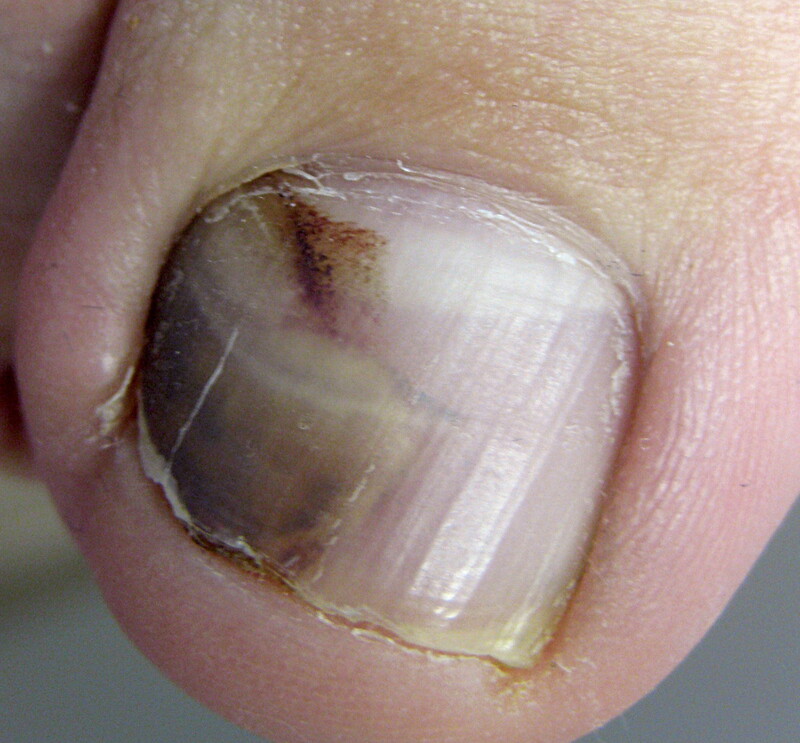 superficial onychomycosis: White patchy discoloration of the dorsum of the nail plate. Chronic paronychia: Red and swollen nail folds, cuticle loss, and secondary nail plate changes. Onychocryptosis occurs when the nail plate penetrates into the adjacent lateral nail fold secondary to nail plate overcurvature, subcutaneous in-growing toenail, or lateral nail fold hypertrophy. It manifests clinically with inflammation of the lateral nail fold, which might be associated with granulation tissue and secondary infection. Although more common in young adults, onychocryptosis might infrequently be encountered in older persons, resulting in substantial pain, walking difficulties, and disability.1,2,18 Underlying causative factors include inappropriate nail cutting, long toes, prominent nail folds, ill-fitting or high-heeled shoes, hyperhidrosis, and bony abnormalities. Vandenbos and Bowers, who believe that ingrown toenails might be caused by overgrowth of surrounding skin rather than nail abnormality, performed a procedure (known as Vandenbos procedure) that was based on excising and removing an adequate amount of soft tissue from around the nail plate.22,23 However, this procedure, reported as not having any associated recurrence or osteomyelitis, is not recommended for elderly patients who commonly have associated dystrophic, thick, discoloured, or curling nails or fungal infections.22,23 Postoperative complications include nail bed infection, recurrence, or poor cosmetic outcome. Noël18 described surgical decompression of the ingrown toenail (by removing a large volume of soft tissue around the nail plate and relieving the inflammation) without matricectomy as very effective (level III evidence).21 Using this method, complete preservation of nail anatomy and function can be achieved with excellent therapeutic and cosmetic results. Subungual hematomas (Figure 7) are commonly observed in elderly people. Subungual hematomas initially present as painful, red, subungual discolorations that move forward and tend to become bluish and less tender with time. Occasionally, distal onycholysis with subsequent spontaneous avulsion of the nail plate can occur as a late consequence. It is in fact this forward and distal movement of the discoloration under the nail plate that can be a very helpful clinical clue, distinguishing this lesion from melanocytic lesions such as nevi and melanomas. In difficult situations in which an evident history of trauma is not present, a urinalysis reagent strip can be a non-invasive and very efficient method of diagnosing blood under a nail24; however, it should be kept in mind that blood presence under the nail plate does not rule out a concomitant neoplasm completely, as subungual tumours might spontaneously bleed or might be preceded by or first recognized only after a minor trauma.25 The condition is most commonly caused by trauma, which results in nail bed laceration followed by accumulation of blood in the nail plate.1,2 Other less common causes include diabetes mellitus, amyloidosis, or anticoagulant therapy. 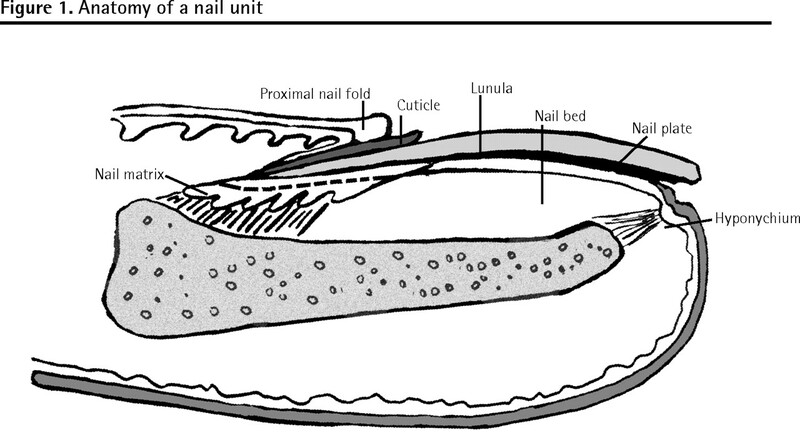 Management mainly centres on reassurance and observation of the nail; however, in acute, tender cases, relieving pressure might be accomplished by drilling a hole through the nail plate. After ruling out melanoma, chronic cases are best observed for spontaneous healing to occur. Subungual hematomas: Red to bluish subungual discoloration. Splinter hemorrhages usually present as linear discolorations under the nail plate, progressing from an early red to a dark-brown or black colour in a period of a few days.1,2 Splinter hemorrhage location under the nail plate might be a clue to the underlying cause, as those located in the middle or distal third of the nail plate are typically trauma-induced, while proximal location is usually associated with systemic diseases such as cholesterol emboli, connective tissue disorders, or infective endocarditis. The latter proximal type is generally more common among young adults and requires treatment of the underlying systemic disorder, whereas the former trauma-associated distal type is observed more frequently in the elderly population and commonly resolves spontaneously. The incidence of common nail apparatus malignancies such as Bowen disease and melanoma tends to increase with advancing age and is usually highest in the elderly population. Longitudinal melanonychia: A longitudinal dark band can be a manifestation of melanocytic lesions, drugs, or Bowen disease, among other causes. Longitudinal erythronychia: A longitudinal red band can rarely be a manifestation of Bowen disease. Nail apparatus melanoma (NAM) usually affects Japanese and African Americans and classically presents as a solitary longitudinal melanonychia of the big toe, thumb, or index finger.27 Hutchinson sign, which is characterized by pigment extension from the nail bed and matrix to the surrounding tissues and which accounts for the radial growth phase of this melanoma, might also be present. Delay in the diagnosis of NAM might account for its relatively worse prognosis compared with its cutaneous counterpart. Initial management starts with a high index of suspicion, especially when confronted with an elderly patient presenting with an isolated longitudinal melanonychia.27 After histologic confirmation of NAM, treatment is then customized based on the melanoma stage. Several other conditions should be considered when evaluating an elderly patient with nail changes, including those changes associated with cutaneous inflammatory disorders (such as psoriasis),28 nail cosmetics,29,30 systemic disorders (such as renal disease),31 or medications (such as anticoagulants or β-blockers).32 A brief summary of common nail changes associated with cutaneous disorders, nail cosmetics, and systemic disorders has been provided in Tables 2, 3, and 4, respectively. Elderly patients might complain of common nail changes and dystrophies that cause pain, affect daily activities, are of cosmetic concern, or are even malignant. Awareness of these conditions is essential for family practitioners, as well as other specialists, to reach an accurate diagnosis and provide optimal management. Nail changes are common among the elderly; however, they are often not brought to the attention of primary caregivers and are thus overlooked. Nail changes among the elderly can either cause serious symptoms, impairing the daily activities of this older population whose activities might already be restricted, or be asymptomatic but associated with substantial cosmetic problems, leading to negative psychological effects. It is important that family physicians are knowledgeable about and familiar with common nail abnormalities and their underlying causes in order to effectively reach an accurate diagnosis and provide better care. Il y a beaucoup de changements unguéaux chez les personnes âgées, mais ils sont fréquemment ignorés parce qu’ils ne sont pas portés à l’attention des soignants de première ligne. Les changements causent parfois des symptômes sévères qui nuisent aux activités de la vie quotidienne de personnes souvent déjà restreintes dans leurs activités, ou alors, ils demeurent asymptomatiques mais sont responsables d’importants problèmes cosmétiques qui ont des effets psychologiques négatifs. Il importe que le médecin de famille ait une très bonne connaissance des problèmes unguéaux pour être en mesure de poser un diagnostic précis et de prodiguer de meilleurs soins. Both authors contributed to the literature search and preparation of the article for submission.
. Geriatric nail disorders: diagnosis and treatment. J Am Acad Dermatol 1992;26(4):521-31.
. Nail changes and disorders among the elderly. Indian J Dermatol Venereol Leprol 2005;71(6):386-92.
. The white nails of old age (Neapolitan nails). J Am Geriatr Soc 1982;30(12):734-7.
. Terry’s nails as a part of aging. Intern Med 2008;47(6):567-8. Epub 2008 Mar 17.
. Brittle nail syndrome: a pathogenesis-based approach with a proposed grading system. J Am Acad Dermatol 2005;53(4):644-51.
. Treatment of brittle fingernails and onychoschizia with biotin: scanning electron microscopy. J Am Acad Dermatol 1990;23(6 Pt 1):1127-32.
. Brittle nails: response to daily biotin supplementation. Cutis 1993;51(4):303-5.
. Vitamins and minerals: their role in nail health and disease. J Drugs Dermatol 2007;6(8):782-7.
. Onychauxis. Surgical and nonsurgical treatment. Clin Podiatr Med Surg 1995;12(2):215-20.
. Diagnosing onychomycosis. Dermatol Clin 2006;24(3):365-9.
. Clinical practice. Fungal nail disease. N Engl J Med 2009;360(20):2108-16.
. Epidemiology and prevalence of onychomycosis in HIV-positive individuals. Int J Dermatol 2000;39(10):746-53.
. A clinical and mycological study of onychomycosis in HIV infection. Indian J Dermatol Venereol Leprol 2007;73(6):397-401.
. Cost-effectiveness of diagnostic tests for toenail onychomycosis: a repeated-measure, single-blinded, cross-sectional evaluation of 7 diagnostic tests. J Am Acad Dermatol 2006;55(4):620-6. Epub 2006 Jun 13.
. Therapies for onychomycosis: a review. Dermatol Clin 2006;24(3):375-9.
. Canadian perspectives on antifungal treatment for onychomycosis. J Cutan Med Surg 2006;10(Suppl 2):S34-8.
. Acute and chronic paronychia. Am Fam Physician 2008;77(3):339-46.
. Surgical treatment of ingrown toenail without matricectomy. Dermatol Surg 2008;34(1):79-83. Epub 2007 Dec 5.
. Scabies. Subungual areas harbor mites. JAMA 1984;252(10):1318-9.
. The use of an intermittent terbinafine regimen for the treatment of dermatophyte toenail onychomycosis. J Eur Acad Dermatol Venereol 2009;23(3):256-62.
. Management of the ingrown toenail. Am Fam Physician 2009;79(4):303-8.
. Ingrown toenail: a result of weight bearing on soft tissue. U S Armed Forces Med J 1959;10(10):1168-73.
. Ingrown toenail or overgrown toe skin? Alternative treatment for onychocryptosis. Can Fam Physician. Vol. 54. 2008. p. 1561-2. Available from: www.cfp.ca/cgi/reprint/54/11/1561. Accessed 2010 Sep 17.
. Medical pearl: subungual hematoma: a simple and quick method for diagnosis. J Am Acad Dermatol 2006;54(5):877-8.
. Subungual blood is not always a reassuring sign. J Am Acad Dermatol 2007;57(1):176.
. Common nail tumors. Dermatol Clin 2006;24(3):297-311.
. Pigmented nail disorders. Dermatol Clin 2006;24(3):329-39.
. Common nail disorders. Dermatol Clin 2006;24(3):349-54.
. Nail diseases related to nail cosmetics. Dermatol Clin 2006;24(2):233-9.
. Nail cosmetics. Dermatol Clin 2006;24(3):393-9.
. The nail in systemic diseases. Dermatol Clin 2006;24(3):341-7.
. Drug-induced nail diseases. Dermatol Clin 2006;24(3):387-91.